Yousearch.io is the PUP that uses misleading techniques to prevent removal. Use Reimage to locate malicious components and get rid of them faster than with uninstall instructions. A full system scan blocks virus reappearance and prevents traffic to malicious domains. At first sight Yousearch.io might look like an ordinary search engine. It has a simple and clean design. However, the biggest problems are hiding under the innocent look. This search engine generates search results from its own database. Thus, this feature allows altering search results, and authors of this app might be interested in doing that. Indeed, it sounds unfair, but developers of PUPs do not care about playing decently. One of the main functions of the hijacker is delivering commercial content. It may include sponsored links into search results or provide various forms of online ads – banners, in-text, ads, pop-ups, etc. Thus, using this search tool, you may encounter a world of aggressive and useless advertisements. Only Yousearch.io removal can help to escape unwanted ads and possible threats they might be hiding. 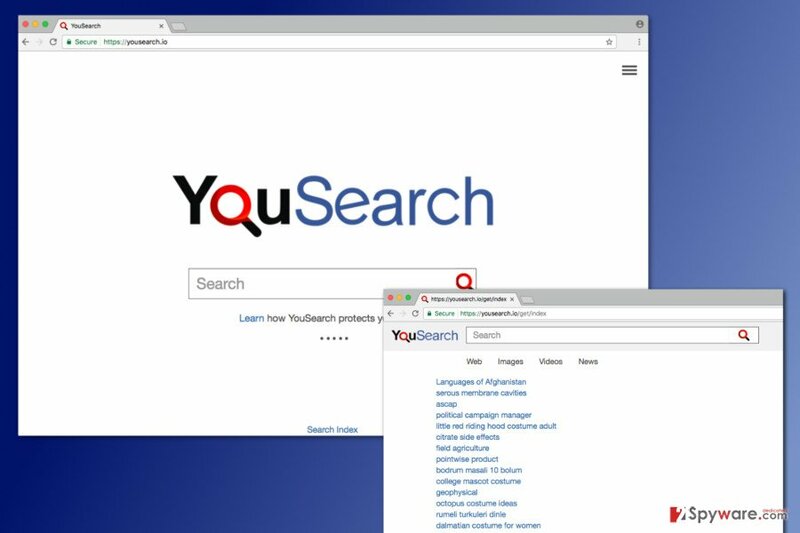 Yousearch.io browser hijacker might be collecting information about you as well. Learning about your frequently visited sites, clicked ads, latest search queries, IP address, computer’s location and other details can help to deliver accurate and engaging advertisements. The rules of the game are simple. Personalized or interest-based ads get more clicks than regular ones. As a result, developers of the PUP generate revenue from advertising. However, Yousearch.io redirect tendencies are worrying. Some ads or links may lead to the potentially dangerous websites where you can get infected or scammed. Thus, you should not click commercial content and get rid of this program ASAP. Yousearch.io is a bogus search engine that can hijack web browsers after incorrect installation of the freeware. Authors of Yousearch.io virus use a software marketing method called bundling. This technique allows attacking this search engine as an optional component to the software package and promoting it with the help of freeware or shareware. Free programs that you can easily download from various online sources often include third-party apps. There’s nothing wrong with this method because users can reject installation of these programs. However, in order to do that they need to opt for the “right” installation method. If you found Yousearch.io set as your default homepage, it means that you made a wrong decision when installing a recent program. The “right” settings are known as “Custom” or “Advanced.” However, only choosing them is not enough. You need to slowly and attentively complete each step. If you rush to click “Next” button, you may overlook such pre-selected agreements as “I agree to make YouSearch my default search engine” or install other PUPs. It goes without saying that you need to unmark all ticks and stop unwanted applications from stepping into your PC. Unfortunately, the majority of users install new programs under “Recommended” or “Standard” settings which do not have this option. As a result, suspicious search engines, annoying browser extensions, and other apps are installed silently. One of the Yousearch.io removal options are investigating computer’s system and deleting hijacker-related components manually. This method requires putting some effort and patience. However, our team wants to help you and offers to use a step-by-step guide that helps to terminate the virus from the system and web browsers. However, in some cases, browser hijackers might install various entries that are hard to detect manually. If you complete our guideline and this search engine still bothers you, probably, some of the malicious components are still on the system. 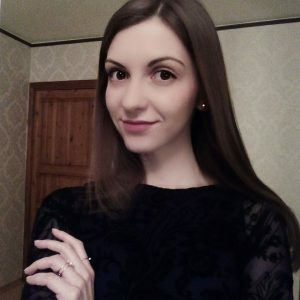 In this situation, you should scan the computer with a reputable anti-malware program and remove Yousearch.io automatically. Though, we recommend going for the automatic elimination option primarily. It helps to save your time and protect your device from cyber threats in the future. In order to remove browser hijacker, you need to delete all hijacker-related entries from the computer. The instructions below will help you to do that. Here, look for Yousearch.io or any other recently installed suspicious programs. If your Mac OS X got hijacked, follow the steps below to delete hijacker manually. Wait until you see Applications folder and look for Yousearch.io or any other suspicious programs on it. Now right click on every of such entries and select Move to Trash. Yousearch.io removal requires deleting unknown browser extensions and resetting Internet Explorer. When in the new window, check Delete personal settings and select Reset again to complete Yousearch.io removal. To get rid of the virus entirely, please follow the guidelines below. You need to delete suspicious entries from the device and reset Microsoft Edge. Once these steps are finished, Yousearch.io should be removed from your Microsoft Edge browser. Deletion of the Yousearch.io requires uninstalling unknown browser extensions and resetting Mozilla Firefox. The latter step is necessary in order to delete tracking cookies and other hijacker-related entries. Here, select Yousearch.io and other questionable plugins. Click Remove to delete these entries. Now you will see Reset Firefox to its default state message with Reset Firefox button. Click this button for several times and complete Yousearch.io removal. Follow the step-by-step guide and delete suspicious browser extension, plugins or add-ons. Then reset Google Chrome to delete tracking cookies. Here, select Yousearch.io and other malicious plugins and select trash icon to delete these entries. Click Reset to confirm this action and complete Yousearch.io removal. In order to get rid of YouSearch you need to delete unknown entries from Safari and reset browser as shown below. Here, select Extensions and look for Yousearch.io or other suspicious entries. Click on the Uninstall button to get rid each of them. Here, look at the Homepage field. If it was altered by Yousearch.io, remove unwanted link and enter the one that you want to use for your searches. Remember to include the "http://" before typing in the address of the page. Now you will see a detailed dialog window filled with reset options. All of those options are usually checked, but you can specify which of them you want to reset. Click the Reset button to complete Yousearch.io removal process. ^ Chris Crawfurd. Bad Ads Range From Annoying to Dangerous. Clickz. The Website Provides Insight And Analysis On The Latest Trends, Tools And Technology In Digital Marketing And Advertising. ^ Larry Loeb. Malvertising Poisons Banner Ads. Security Intelligence. Analysis & Insight on Information Security. ^ How online advertisers read your mind. The Economist. Offers authoritative insight and opinion on international news, politics, business, finance, science, technology and the connections between them. ^ Online Advertising Models: CPC, CPM or CPA?. Promise Media. Online Advertising and Marketing for Small Business. ^ How Ad Networks are Being Used for Scamvertising. Zvelo. The Official Website Of The Software Company. This entry was posted on 2017-04-21 at 05:16 and is filed under Stealing programs, Viruses. You can quickly scan the QR code with your mobile device and have Yousearch.io virus manual removal instructions right in your pocket. How did you remove Yousearch.io virus?